Originally conceived as a sanitation device, the Tidal Basin has become the focal point for the flowering of the Cherry Blossoms in April and visits to the Jefferson Memorial. The trees were presented as a gift from the city of Tokyo to the city of Washington in 1912. Mayor Yuko Ozaki of Tokyo was a legendary Mayor of the city who fought against militarism in Japan. He was responsible for the generous donation of cherry blossoms to Washington. He visited the city in 1950, shortly before his death in 1954 at the age of 95. The annual blossoming of the cherry trees is celebrated in the Cherry Blossom Festival, which approximately coincides with the blooming of the trees. Weather conditions greatly affect the timing of the blossoms, so the festival isn't always celebrated when the cherry blossoms are in bloom. The Tidal Basin was built as part of the construction of East and West Potomac Parks. The Army Corps of Engineers designed the project to aid in the movement of water through the Washington Channel to prevent pollution. As the tides rise, the Tidal Basin is filled with water from the channel. When the tides recede, gates on the Potomac side of the basin open, and the basin water is released into the River. The circulation of water is responsible for keeping the channel relatively clear of pollution. 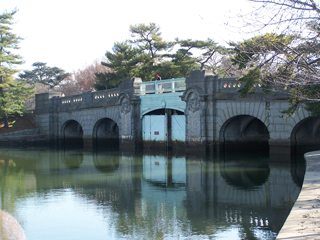 The ingenious design of the Tidal Basin worked well when it was first put into operation in the early 1900s, but the flushing did not prevent the spread of pollution. In 1924 the bathing beach at the Tidal Basin was closed due to pollution. The gates were not always maintained. By the 1950s and 1960s, the pollution of the Potomac and the Tidal Basin had become a national disgrace. Negative publicity about the condition of the "Nation's River" was a major factor in passage of the Clean Water Act and improvements in wastewater treatment, particularly at the Blue Plains Wastewater Plant. Improvements in the maintenance of the Tidal Basin have also brought back fish life as well. Paddle boating on the Tidal Basin is one of the great traditions in the area. Boats are available for rent for $12 per hour for two people, from 10 AM to 6 PM. During the Cherry Blossom season, paddle boats may be reserved online.